For my second Instant Pot test, I stayed with Melissa Clark’s book and chose one of her beef recipes. To me, getting the Instant Pot was to save time, so I wasn’t about to spend 24 hours marinating the beef ribs like I normally would if I mean to braised them. I stopped by Whole Foods after Sunday brunch to buy $25 worth of beef short ribs, rubbed them with the ground coriander and salt and pepper, and just let them sit while I walked Atticus for a few minutes. I started working on the recipe as soon as we returned from our walk. It turned out deliciously. I give the Instant Pot high marks on sustaining the flavor. 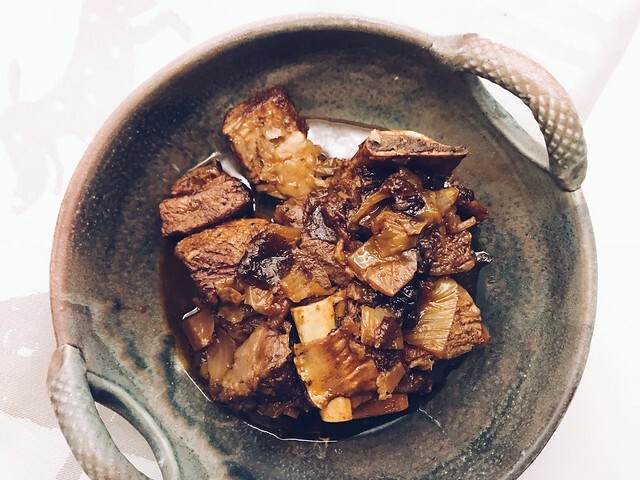 From my experience with a slow cooker, the flavor would always just be on the outside, but inside the meat, it was almost non-existent even if I browned them beforehand. It took only 35 minutes to high pressurize these beef ribs and the depth of flavor was in there as if I actually braised it for 2 hours. So guess who’s becoming more of a fan now? 1. 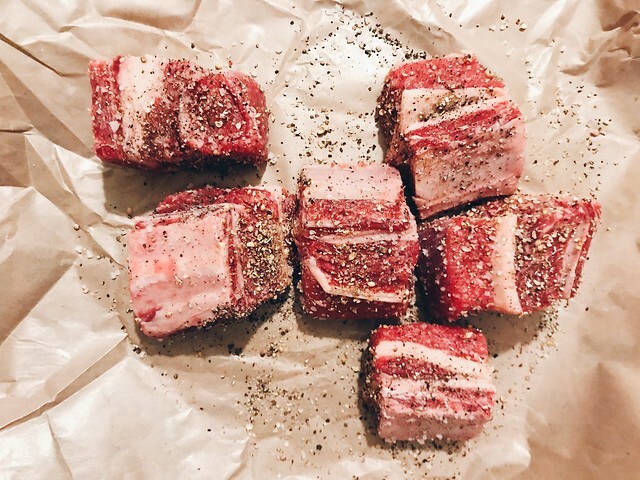 Rub coriander, salt, and pepper all over the beef ribs and let sit at room temperature for a few minutes up to 1 hour. 2. Using the sauté function of your Instant Pot, add oil and sear the beef until evenly browned on all sides, about 2 minutes per side. Remove to a plate. 3. Add leeks and fennel, and cook until soft, about 8 minutes, then add garlic, chile powder, and tomato paste; cook for 2 minutes. 4. Pour in wine. Add prunes and then add beef pieces back. Cover and lock the lid properly. Select the Pressure Cook function for 35 minutes. When it’s done, do a quick release after venting and letting the steam out. Serve on top of a big pasta, like pappardelle. Join the bandwagon and get your own Instant Pot already!